Themes of exile and homecoming are explored in Hugh Leonard&#146;s Da. The story revolves around the living memories of Charlie (Se�n Campion), a grown man who returns home to Ireland after the death of his father (Stephen Brennan) only to find the old man&#146;s presence still very much alive (and trying to make cups of tea). It is perhaps indicative of the ironies which inform Irish theatre that the play, one of Leonard&#146;s most popular and best known, was first performed in the United States. After premiering in Maryland in 1973, it went on to become the first Irish play to win a Tony Award. It received its first staging at the Irish National Theatre ten years after and was filmed (with Barnard Hughes re-creating his Tony-winning performance) in 1988. Da is an intricate study of the paradox of influence in some ways similar to Michel Tremblay&#146;s For the Pleasure of Seeing Her Again but lacking that play&#146;s concern with artistic inspiration. Though informed by a political sensibility and featuring elements of allegory, the play is a character piece in which a man struggles with his sense of himself as defined relative to those around him. Like an Ireland which in the 1940s seemed the errant teenage child of an elderly, petulant England, a younger Charlie (Alan Leech) faces his older self on stage and expresses his disappointment with the man he has turned out to be. He is older, yes, but his life is still constrained by the personality of another, the ever-present Da. The active nature of the characters&#146; memories is central to the themes, drama, and staging of the play. Leonard keeps the present and the past in constant dialogue, and the failures and disappointments of one inform the perception of the other. The playwright successfully avoids the pitfalls of sentimentality and nostalgia by refusing to let the characters sit comfortably in a haze of simplistic remembrance. Though often warm and funny, the play is not soft. It frequently explores the less agreeable side of Irish identity, and revels in exploding its hypocrisies. Neither Charlie nor Da are without fault, and no-one on stage is completely inoffensive. Da&#146;s impassioned speech in support of Hitler still seems shocking, and the calculating aloofness of old Mr. Drumm (John Kavanagh) still raises a hackle of recognition akin to a pantomime hiss when he first appears. Charlie himself appears ungrateful and arrogant as a youth and guilty of neglect as an adult. Even Ma (Anita Reeves) is not without blame in her attempts to bait her husband with stories of an old flame who has just come back to town and wants to see her. The specter of dysfunction and dystopia seems to hover over the stage, and the satiric barbs are not reserved for &#145;outsiders&#146; like the Protestant Lady (Deirdre Donnelly) who employs the old man as a gardener. 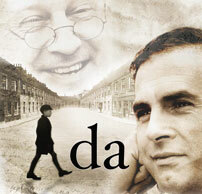 Though it might not sound like it, Da is a tender and touching drama of ordinary people in an identifiable and understandable world. There are many funny scenes and the dialogue is laced with a characteristic Dublin wit which results in several memorable one-liners. Amid the complexities of these characters is a a vivid sense of a life lived, an evocation of time and place which is conscious of its reflected nature. Though some have argued that Leonard&#146;s use of the past provides an escape from genuine confrontation, Da is centrally preoccupied with the idea that our memories and our perceptions are exactly what we make of them, and can be used to celebrate or berate ourselves and others. In the play&#146;s most moving scene the barriers between memory and the moment break down as an increasingly senile Da re-enacts a key event from his earlier life, mistaking his son for his father-in-law. This is an intimate play, and in spite of designer Paul McCauley&#146;s designs, the current production at the Abbey does not quite capture its sense of enclosure. Most of the action takes place within a confined kitchen set upon the much larger stage, and though several important moments take place &#145;outside&#146;, the sense of broad space on the stage sits uneasily with the text. Director Patrick Mason is well familiar with the material though (he directed the 1983 production), and draws out its full thematic richness. The production is boosted in no small measure by the central performance by Stephen Brennan. The actor captures the complexities of the character well, delivering his cheerfully dismissive &#145;nod and wink&#146; dialogue with a sense of physical deportment which frequently demonstrates the distance between the spoken and the unspoken. Se�n Campion (Stones in his Pockets) is less subtle, but drives his characterization with a portrayal of anger which befits the role. Leech is better as young Charlie, motivated not only by anger, but a mixture of adolescent and more fundamental frustration. John Kavanagh is superb as the imperious Mr. Drumm, (later star of his own play A Life, the most recent production of which featured this actor in the part). His modulated tones and stiff manner give way in one powerful and telling scene. Jasmine Russell is also excellent in the small but pivotal role of &#145;the yellow peril&#146;, an alluring blonde girl at the center of young Charlie&#146;s sexual fascinations who, in the play&#146;s funniest scene, is &#145;reduced&#146; to a human being; angry, frightened, and vulnerable.